One thing Publishing Genius authors are doing over the course of the year is interviewing each other in a chain. In this installment, Stephanie Barber talks to Megan McShea about her new book. 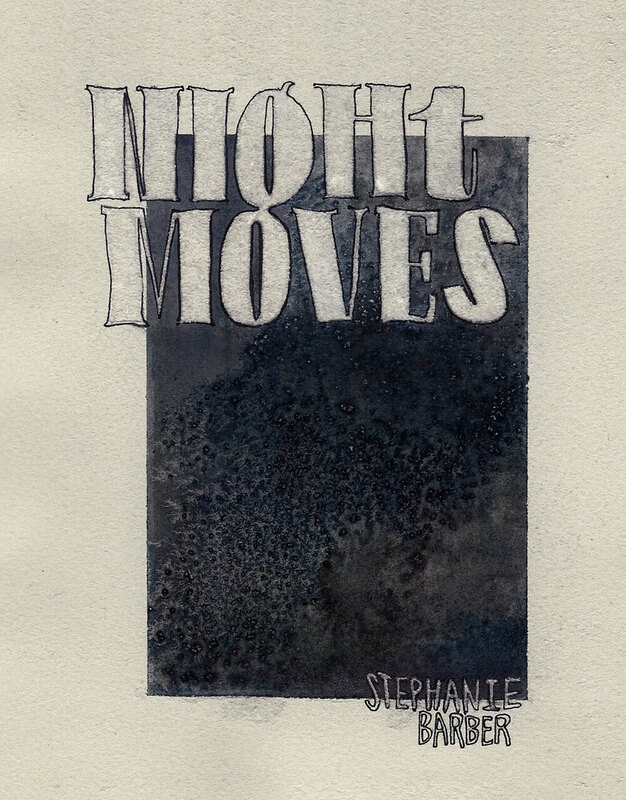 STEPHANIE: i love the way the first 10 or so pages are small snippets of a poem. i was imagining them as one poem broken up by page turns or as poetic koans getting me into the meditative space needed to receive the longer poems. it’s a sort of classic theatrical introduction to location and characters. what made you think about opening the book in this delicate and unusual way? MEGAN: That was 100% Adam Robinson in concept and execution. I won’t speak for him as to where the idea came from, but I like how, in drawing lines from the pieces in the book and reassembling them into a completely different piece, it gives the book an added set of echos, which are always a pleasant sort of hook, and also because of the interactivity of the act. I wish I had a better word for that because interactivity makes me think of website design, and that’s not the kind of interactivity I mean. To me, it would be the best of all possible reader encounters if a reader felt activated, free to play with the images and ideas and language there. So when Adam just up and did that and made it part of the book, I just thought, well, perfect. STEPHANIE: oh, i see. it really does work so well, i like thinking about them as echoes. they are sort of pre-echoes. how about the quotes by kenneth patchen and yves bonnefoy? they seem to contradict each other. language as hope and language as killer—why did you choose these and how do you see them impacting the reader’s thoughts about your poems? MEGAN: I hadn’t even noticed their opposite-ness but I see what you mean. They have such different tones, heavy and light, but I sort of see them as saying the same thing in different ways. They’re both conferring language with an animating power as well as a deadening power. As an animating power, language can be world, energy, animal, life, and it can put us in direct contact with those things, or put us in their presence as Bonnefoy says in another part of the interview. But for both writers there also seems to be some force that has deadened language, something that has to be thrown off in order to re-animate it. Those ideas resonate with my experience of writing. It’s like I’m trying to wake up the words, and wake myself up with the action of the words. This probably isn’t a foreign idea to most poets, I imagine. I’d be glad if people who read my writing experience that, some of what I experience writing it, that it makes language new and alive, animates them somehow. Thinking about it now, I am noticing how the opposite tones of the two quotes, one heavy and one light, also reflect something in my work. It does oscillate between the two qualities, I think. STEPHANIE: can you take us through one of your poems and talk about the language as animating power and deadening power simultaneously? To continue being general (sorry, I know you’re trying to get me to be specific), I think readers will recognize strategies of disruption in most of the pieces in the book—disruption of logic, of meaning, of grammar, of any convention available, really—narrative, character, etc.—nothing that hasn’t been done before, of course. Hopefully these strategies will trigger something in their imagination or consciousness, heighten their attention, and maybe activate a sense of freedom to let language misbehave, and experience some of the gifts it can bear when it’s freed from its duty of imparting particular meanings or functioning in expected ways. The quotations from Patchen and Bonnefoy are aspirational statements about what I take the whole project of writing to be. I would guess that a lot of writers who’ve embrace experimentation would also embrace those aspirations. STEPHANIE: it’s interesting in terms of this concept you are proposing, this giving the reader a process which triggers a sort of linguistic dance session, that the first full piece in the FIRST PART is called “The Brain is a Pleasure Organ.” it connects with both what you have written above about activating a sense of freedom as regards language as well as working against the sparse compositional beginning to the book. MEGAN: Yes, thanks. That piece probably spells it out much better than I could in plain language. A dance is a good analogy. This is also why I immediately loved your collage for the cover, because reading this stuff is something like going into the woods. It asks something of readers, you have to go into it, but it’s likely there will be unexpected delights. STEPHANIE: “Going into the woods” makes me wonder where you wrote the majority of poems in this book? Where, when, how? How does where or when you write affect your form or content?? 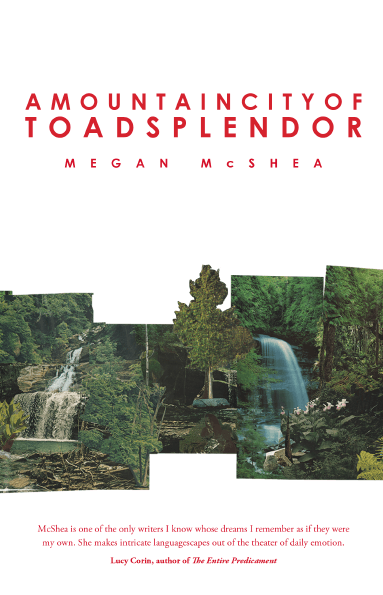 MEGAN: I wrote the pieces in this book over a period of about 10 years, and almost all of them were written alone in my house, and often in the morning, or some other part of a day in which I had the luxury of not breaking my solitude until late in the day. I’m easily distracted, so once I’m out and about I find it difficult to conjure up the right kind of focus to write. And for like 20 years I have written on a manual typewriter. This is a somewhat embarrassing confession because it seems to imply a romance I am having with ye olde writers and their typewriters or something, but actually borrowing an old army-issue typewriter from my boss at my first post-school job got me started writing, and it’s a habit I have a hard time breaking. I like that you have a session on the typer, and then you have this artifact of the session, ink on paper. I think the speed of it (cast iron, not electric) is just a little slower than my thoughts and somehow that bends the language in a way I like. There are a few pieces in the book that were written during live performances of experimental improvised music, by hand, sitting in the audience. I say which ones they are in the notes section at the end. Those pieces are more artifacts of my own active listening at a performance that is wildly unstructured, so improvised structures are getting thrown up every minute, and I just try to record that somehow in words. I guess that practice is something close to my writing at home alone on the typer in a way. It’s just that what I’m tuning into is more internal at home. It’s so liberating to leave the interiors once in awhile. And when it’s a group improvising, you can hear them listening to each other, and you sort of feel like a collaborator even though you’re not out there in front of the audience. It’s a secret collaboration. A super-shy collaboration. STEPHANIE: i like this idea of a secret collaboration. i’ve always thought all art work is a collaboration with all other art that has come before it, the way we build upon each other implicit and explicitly (like engineers GETTING AT IT). So for “Parked,” “Damn Pigeon for Company” and a number of the other you were ‘”hired” as the bard for the High Zero Festival and so these “collaborations”, do they feel more musical to you than the others? Or less musical in an attempt to counterbalance the music? Do you remember how any of these listening pieces went in and out of ‘collaboration’? MEGAN: I totally agree about the grand collaboration that is art. I think we’re all channeling influences all the time, taking what we’ve absorbed and making it into something else. One year the High Zero festival in Baltimore did hire me as a sort of festival writer in residence in exchange for a festival pass, which was a very intense few days of listening and writing. If memory serves me right, “Idea for a Song” is from that batch. That one turned out more narrative than usual. I was naming sounds and describing their actions. Oh, this sound is an elephant, a rock star and Philip Glass make an appearance, an ice cream truck, something falls over a cliff, takes a train, signals are sent back and forth between a dolphin and a quail, there’s weather. But I also just go to shows now and then and write surreptitiously. I like to think that musicality is one of my strengths as a writer, that the music is always there, but when I’m writing from actual live music, the rhythms and images are coming from sounds produced by others, rather than my own lyrical instincts. I’m trying to pick up on their lyrical instincts and translate them into words, and it’s an inspiring challenge that leads to things I can’t predict. “Crap Collapse on the Slow Channel” was a piece I wrote during a performance by a DC outfit called Caution Curves. It’s the one we took the title of the book from. That one is more fragmented, which is another thing writing to music triggers, because the music usually moves and changes more quickly than I can write, so I don’t really finish one thing before I’m off to the next. So the writing leaps a lot, and in fact, might be a little less lyrical because of the fragmentation. My reaction to that effect as a writer is to find other ways to make the words cohere, by repetition, say, or simply rhyming, carrying a family of vowel sounds through for continuity. That piece also sets up a dynamic relation of pronouns, which provides a sort of structure, goes from a third person thing to a first person presence back to some third person action then resolves in a first person plural, a we. Of course none of these persons are anyone, but I find that sort of dynamic satisfying. Going from “I” to “we” has a certain feeling to it. It’s a natural instinct when reading to try to locate a subject, who’s doing the action? who’s thinking the thoughts? who’s feeling the feelings? and when you can move the subjectivity of the piece around among these basic conceptual entities, I, you, it, he, we, they, it suggests relationships, and it can have all these different sort of effects. STEPHANIE: yea, it also changes the readers participation. it moves dangerously close to collusion. do you have a favorite poem in this book? MEGAN: Gosh, that’s hard. Well, my favorite title is “Yelling Séance in a Crowded Theater.” That piece is a favorite, too. I think I’m kind of partial to the ones that lean just a little more to the narrative side, like “The Appointment,” “Cannibals and Canopies,” “Us and Her.” And the elegy, “A Perfect Bedlam.” Okay, so that’s five. And five is also my favorite number, so I’ll stop there.